I stood in the hotel lobby of the Marina Del Mar in Key Largo, Florida that July 2009 morning when he caught my eye. His outstretched arms beckoned me closer; his expression kindly benevolent. The turquoise water exuded serenity as he appeared to bless all His creations tucked deep underwater. 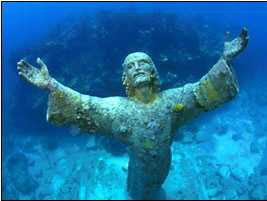 A photo of the Christ statue displayed on a 4 x9 inch tourist rack card lured snorkelers and divers alike to John Pennekamp State Park to see Him. The statue fascinated me then and still does. Yes, emphatically, yes, to those who have listening ears. From a slender postcard stuffed among many, there He stood silent, yet speaking to my tenderized heart. Since surrendering my heart to the leadership of Jesus Christ in 1978, I’ve found that He has much to say. It is me who often is not listening, rather, than He not speaking. Around the year 2000, I committed myself to dial down as Stuart Greaves of the International House of Prayer said, and quiet my heart to hear God. Training oneself to dial down is a discipline that can be learned. Although challenging for competitive type A personalities like myself, it can be mastered. Through consistent practice, Holy Spirit has been apprenticing me in the fine art of Practicing His Presence, as Brother Lawrence calls it. I am learning to quiet my soul and heart so that I can operate in the natural yet simultaneously walk in the Spirit. This is my life goal. I am learning that I can drive my car and pray for others with my eyes open, all the while hearing what the Spirit is impressing upon me to pray for them. I used to not be able to do that. Although Jesus intercedes for us at the right hand of the Father (Hebrews 7:25), He is continually whispering intentions to earth for humans to utter out loud. The Maestro calls the shots of His earthly orchestra so as to yield a harmonious symphony of united sound. When I first set my mind to learn how to quiet myself to recognize God’s voice, I had difficulty hearing if there were any distractions. Heck, if there was any noise whatsoever, if a bird flew by the window, I was like an ADD child off to play. It was hard, man! A friend described me as a wiggler, you know, the type of child who squirms on your lap because they cannot seem to settle down. That was me in the presence of God. As I became more proficient over time, I am learning to juggle the different terrains of each world, the spiritual and the natural as I navigate in and out. What? You go in and out? Are you crazy? No, we all go in and out of the supernatural realms each time we pray. I’m learning to walk simultaneously in both, just as St. Paul described in Galatians 5:17 and 5:25. Some days I do well. Other days, I fail miserably, ever mindful of my humanity. God desires for all of His kids to walk in the Spirit 100% of the time, constantly guided by His voice. He is the original VOICE, not a television show. In my journey I’ve learned that hearing God is attainable or Saint Paul would not have urged us forward to do so, just as Jesus would not have modeled for us behaviors beyond our grasp. Notice, we are advised to walk in the Spirit at all times, rather than to “never sin.” If we are walking in the Spirit, we will not sin. Impossible, you think. By the way, I like the way the Lord always emphasizes the positive instead of the negative. It IS possible or Paul would not have written it. We achieve a goal by focusing on the positive, not by trying to stop doing the negative. When one wants to lose weight, nutritionists recommend you change your eating habits to concentrate on eating healthy versus dieting. God demonstrated the identical principle for us by calling those things that be not, as though they already existed. In Song of Songs, Chapter 4:1-8, we see Jesus prophetically verbalizing in an affirming tone the eight budding virtues that He sees in the young Bride’s life. These positive affirmations are part of Father and Son strategy to equip the immature church against satan’s accusations. Here we see Jesus calling forth the character traits that are undeveloped within her, but that He desires to come forth from her. He informs her that she has dove eyes, eyes of faith and spiritual insight, eyes singly focused on Him alone. He tells her that she has teeth like shorn sheep, meaning that she chews the food of long and loving meditation on the meat of the Word of God. The young maiden Bride is not fully developed and will go onto fail before she reaches her full maturity. I adore the fact that it is while she is yet immature that the Heavenly bridegroom speaks these loving affirmations over her, actually calling these virtues into existence. God sees the end from the beginning! Because God sees eternity, He speaks with confidence, authority and clarity because He sees how she will turn out. And, get this, He has placed eternity in OUR hearts! Who hoo, I have done preached myself happy! 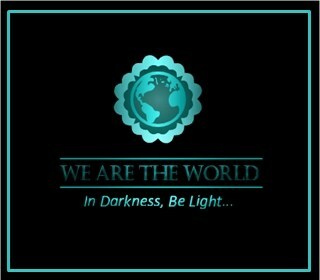 How do we become holy in an unholy world? By declaring ourselves clean, undefiled children of the Light, vessels of His glory who walk not in the counsel of sinners but who walk upright. We intentionally stay on the narrow path He has set before us, walking confidently yet aware of the dangers, not in trepidation but walking with sure steps on a brightly lit path. Moment by moment inclining our spiritual ears to be in tune with His voice and quickly obeying. Our hearing is not a straining to hear, rather a relaxed, attentive listening. We have Him as our daily focus, so His voice is clear, recognizable. The myriad of ways He lavishes us with His love evokes from us a response of rapt attention and wonder. Our years of training have caused us to flow readily at His command; we know His moods and the importance of prompt obedience. Any 9/11 survivor can attest to the vitalness of prompt obedience to an inner witness. Christ of the Deep, the voice of many waters is beckoning you to come near His arms today, for He has much to say to you. “Today, if you will hear His voice, do not harden your hearts as in the rebellion,” Hebrews 3:7 Deep calls unto deep.